As the field of Shared Micromobility continues to evolve, cities are faced with complex questions about how make room for these systems and their mobility benefits while also balancing the need for secure and equitable operations. Join NACTO, the City of St. Louis, and the Better Bike Share Partnership for the 2nd Annual Bike Share Roundtable. Building on 2018’s successful event in Austin, the 2019 Roundtable will convene cities for a discussion of lessons learned in managing and regulating the rapidly evolving space of bike and scooter share. This cities-only roundtable is a unique forum for cities to share information, develop best practices, and ensure that equity and the public interest are central considerations. From this Roundtable, we will update our framework for regulating and managing Shared Micromobility companies, and deepen our understanding of what it means to operationalize equity into these systems. => As the field of Shared Micromobility continues to evolve, cities are faced with complex questions about how make room for these systems and their mobility benefits while also balancing the need for secure and equitable operations. 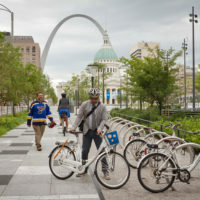 Join NACTO, the City of St. Louis, and the Better Bike Share Partnership for the 2nd Annual Bike Share Roundtable.